← And, I’m Allergic to Mopping Floors. I gotta tell you. It just feels good to do something that’s not all about me or my family. Something that even gets me out of my comfort zone. It’s simply AMAZING what Amy Newberry and her husband, Joshua, have birthed in this project. They are both incredible examples of what it means to be the hands and feet of Jesus Christ. I served Tapestry with a few of my bible study peeps. 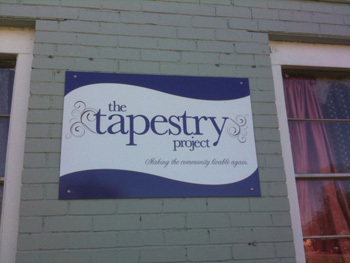 You can see a few pictures from our day by visiting Tapestry’s blog. I really hate that the photo Cindy Beall took of me with a broom in my hand didn’t make the post. But, I did make sure she sent it to my husband. You know….for the shock factor and all. I think, at times, we let ourselves get so overwhelmed at such large needs, that we fail to give the GREATEST gift we can give: Christ. I’ll never forget Amy’s words. And, I’m very excited about serving there again. With my family – including my two children. Who will learn from a very young age that there is a world of hurting people. And, oh what joy comes from being the hands and feet of Christ. wow, that is awesome and so moving. You are such a sweet person and such a giving soul. I am proud to say you are my cousin!